TM: Section Nosphinium, subsect. Boreali-Americanae [NEW classification, 2010]. 2N=54, IPCN 86-87, Canne, J.M., 1987. Carl Ludwig von Willdenow, 1765-1812. 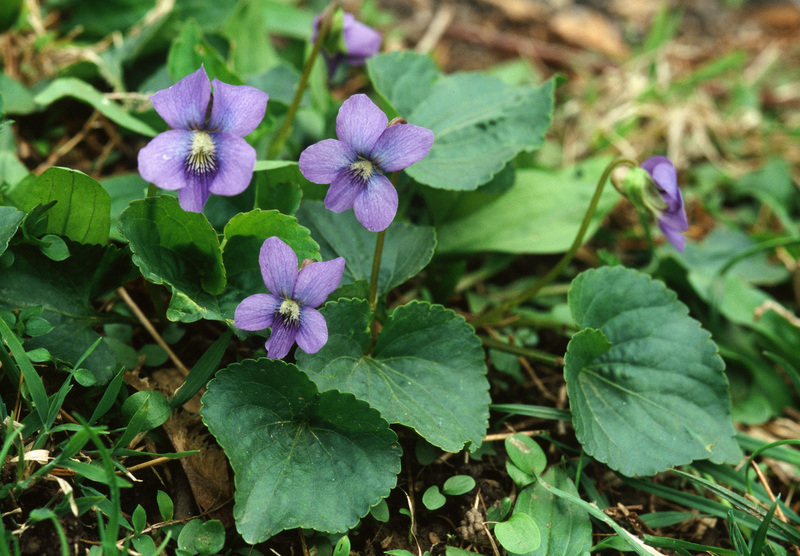 There are two large and three small species of stemless blue violas with undivided leaves. Viola sororia and Viola cucullata are quite common, but are often confused. They are large, more vigorous plants especially later in the season. 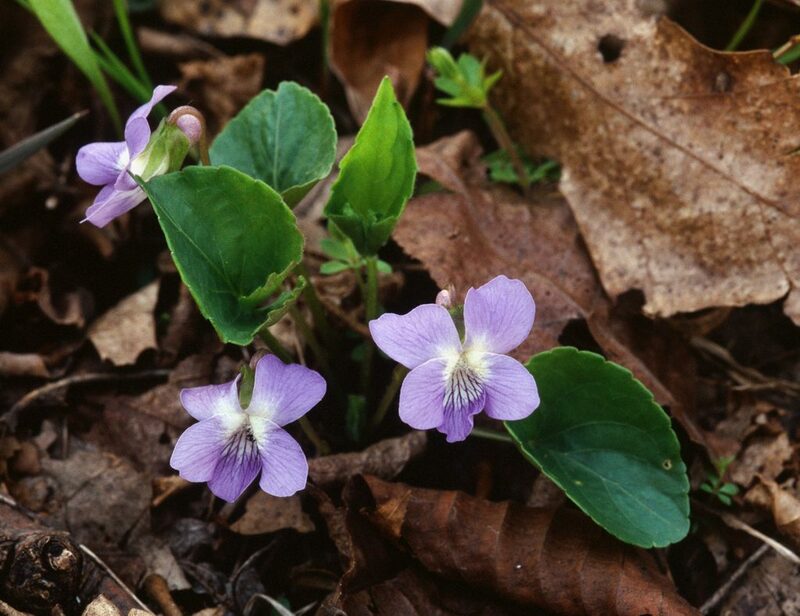 Viola sororia grows in well-drained woodlands, has leaves about as wide as long. 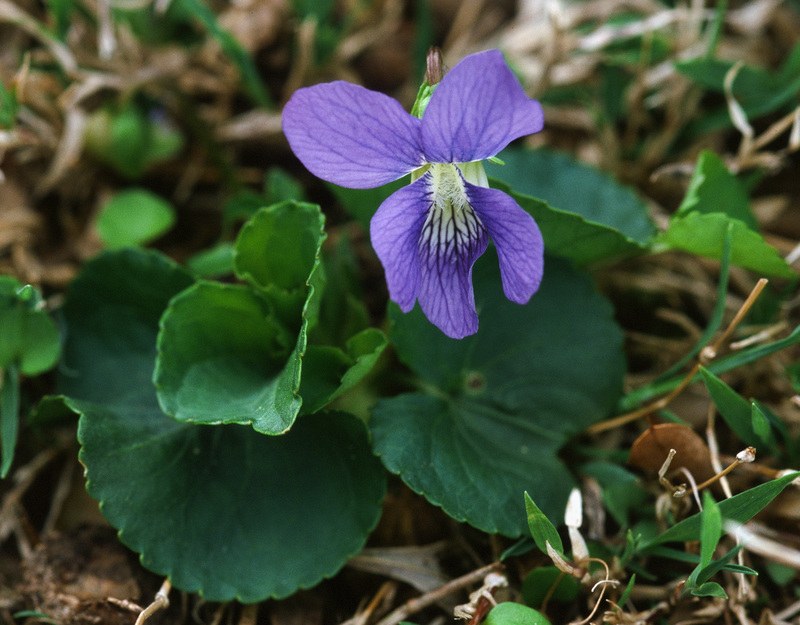 The flowers of Viola sororia are usually purple, but color variants occur, including one of white flowers heavily striped purple in the center, sometimes referred to as the Confederate violet. Flowers are at about the same level as the top of the leaves, the lowest petal is narrow and longer than the laterals, and there are straight hairs on the inside of the two lateral petals. Viola cucullata grows in wetter places, has bluer flowers on very long peduncles, leaves longer than wide, and more gradually pointed. The lowest petal is shorter than the laterals, and the hairs on the lateral petals are club-shaped. The top petals are heavily marked with darker blue, giving the flower a hooded appearance, for which it is named. TM, 17 Aug, 07: Boreali-Americanae and Pedatae differ from all other blue-flowered groups in having aquired an additional genome — from the Nudicaules! This was quite unexpected as I thought they just had duplicated bits and pieces of what they already had got to end up on 2n=54. But here a totally different genome is instead involved, which could not be guessed based on morphology, although biogeography lends support to this. Needless to say I will have to analyse more Bor-Am species in the future. Because of strongly growing robust branching rhizomes it forms extensive colonies. 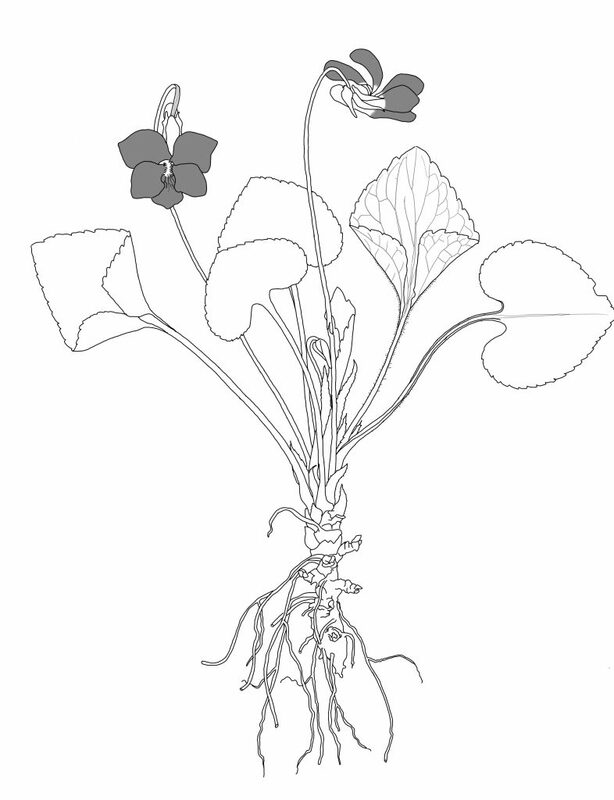 The heart-shaped leaves are somewhat coarse and veiny in comparison to other violets. It is abundant in meadows, on roadsides; it is a serious problem when it invades a lawn. V. sororia has both chasmogamous and cleistogamous seed production – a real problem in lawns. Also adding lime to these lawns will encourage V. sororia. Leaves obviously veined, leaf surface raised between the veins, ‘furrowed’ is the word used in RHS definitions. Harvey says ‘moisture holding soils, neutral to alkaline’. Does not grow at high altitudes. Yes, neutral to alkaline in Ontario Basin, Quebec [Rock Garden Quarterly, Vol. 66, No. 1, Winter 2008, p. 7, ‘A Ramble on the Cedar Grove Trail’ by Zandra Bainas], In the Marlborough Forest resting on the Smith Falls Limestone plain, an area of shallow soil over limestone. Growing under the cedar trees [Juniperus virginiana] is Viola papillionacea [sororia] with Viola [macloskeyi ssp.] pallens, Fragaria virginiana, Waldsteinia fragarioides, Aquilegia canadensis, Trillium grandiflorum, Maianthemum trifolium and M. racemosum, Diervilla lonicera, Cypripedium parviflorum var. parviflorum. The needles from the cedars must alter the pH of the soil to be more neutral because Trillium grandiflorum grows in slightly acid soil [No, see Fred Case’s book, they are on limestone], but Aquilegia canadensis on alkaline. Subtle differences in soil preferences: V. adunca minor on pure limestone; V. canadensis and V. pubescens var. scabriuscula on alkaline soils but with more protection, deeper soils and some poplar and maple leaf litter; V. sororia and V. blanda on limestone substrate with leaf litter modifying the soil, also wetter places. There is some overlap, e.g. at Dorion, Cavern Lake where V. blanda and V. adunca minor grow close together but the former in slightly wetter places, also V. renifolia in the same area as V. adunca minor. These are all limestone plants. New York State, 24-25 April, 2010: Selected limestone areas of Glimmerglass State Park, Otsego County and Van Hornsville School Nature Trail, Herkimer County, sites close to each other. Both places were very early in season, not many plants in flower. Glimmerglass S.P. is at the edge of the Onondaga Limestone. 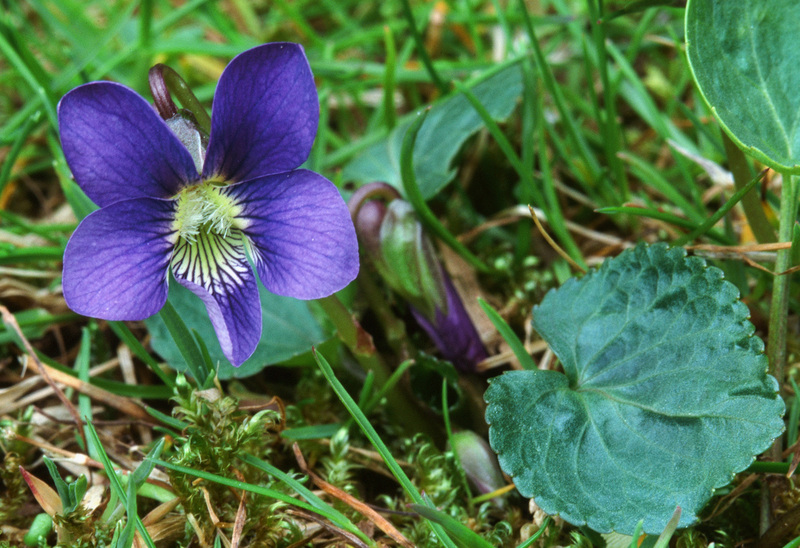 Species seen growing there include: Viola sororia, Viola adunca minor, Erythronium americanum, American Beech (Fagus ? ), Silver Birch, Hickory trees, Podophyllum peltatum, Sanguinaria canadensis, Dentaria laciniata, Trillium erectum and Symplocarpus foetidus (Skunk cabbage). At this site, V. sororia had paler flowers than usual, wider, and sometimes with a wide lowest petal, not the same narrow long lowest petal in other populations. Van Hornesville School Nature Trail was an area of pure limestone shale and tufa rocks, and large tufa walls with caves. 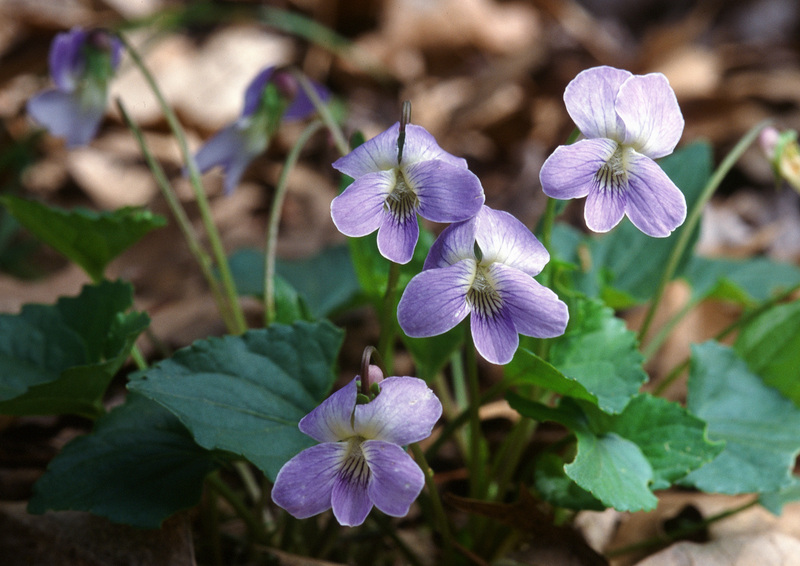 Species: Viola sororia, Viola adunca minor, V. scabriuscula (eriocarpa/pensylvanica), Viola rotunifolia, Erythronium americanum, Hemlocks (Tsuga) were dominant, American Beech (Fagus ? ), Hickory trees, Podophyllum peltatum, Dentaria laciniata, Mitella diphylla, Trillium erectum, Geranium maculatum, Dicentra canadensis and D. cucullaria, Uvularia, Asarum canadensis, Blue Cohosh (Caulophyllum thalictroides). Viola sororia. (V). See comments above, now includes V. papillionacea. V.s. subsp. septentrionalis has hairs on all petals. Peterson Field Guide says: Common blue violet. Smooth; two lateral petals bearded, lower petal longer, unbearded; all three lower petals strongly veined, flowers only slightly surmount leaves. 3-8 inches. Damp woods, meadows. N. Dakota, s. Quebec, c. Maine south. Flowering March-June. V. latiuscula similar but grows in dry soil, mature leaves wider,, purplish beneath. New York, Vermont to mts. of nw. Pennsylvania, n. New Jersey. V. septentrionalis similar, but three lowest petals bearded at base. Leaves often purplish beneath. Open conifer woods, Canada south to Wisconsin, Michigan and New York, New England; in mts. to Virginia. Flowering May-June. Eastern half of Texas, Plain States, flowering March-April. Soils derived from the diabase rock (Iredell on uplands and Wilkes sandy loam at the base of the slopes) are quite different from typical Piedmont soils which are acidic or sour soils which have a low pH. Soils derived from diabase rocks are basic, or sweet, with a high pH. Sweet soil is ideal for certain kinds of plants typically found in other regions of north America, particularly in the prairies of the Midwest. V. sororia at Walnut Run, rte 322 (diabase), also at Shenk’s Ferry. Also growing very vigorously on roadsides of agricultural pasture in Lancaster County (Amish farms), PA. The prairies of the mid-west grow on alkaline soils that are the best for agricultural cultivation. V. sororia very common in cultivated lawns which presumably have been limed. But it is also very common in our lawn that has not been limed, also in our woods; may be because our soil is about neutral. V. conspersa and V. striata thrive where soil has been limed (Lighty). This is a bit more than a simple answer, but I hope it will serve as useful general background to the issue, which is much wider than just V.papilionacea. Some works will tell you V.sororia is hairy, but the species exhibits a wide range of hairiness, sometimes being almost hairless. 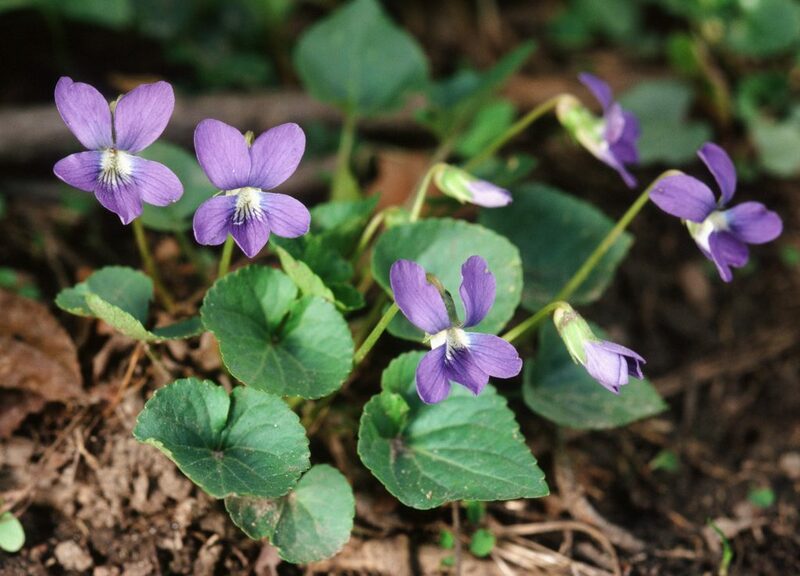 There is also confusion over the origin of the name sister violet: some saying it comes from the freeness with which it hybridizes with other species in its vicinity (making identification even more of a nightmare, of course); others saying it reflects a similarity with Viola odorata, the common sweet violet of Europe. 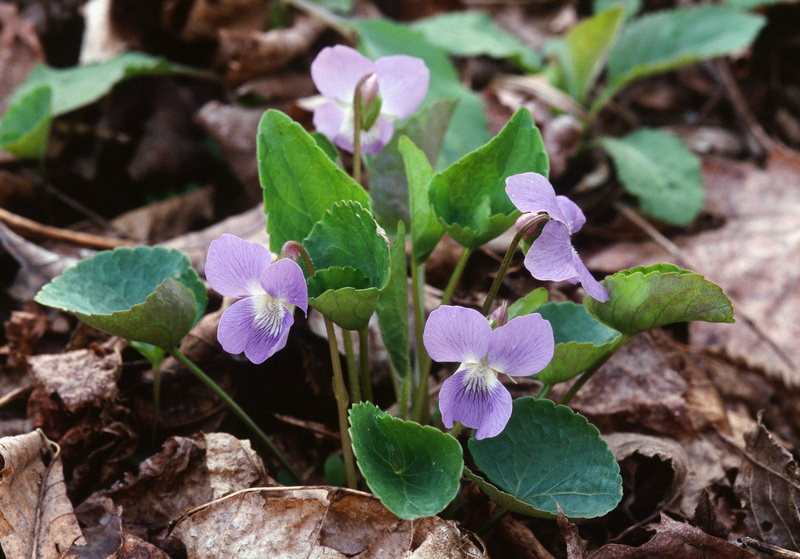 Like many violets, the flowers of V.sororia come in a range of colours from the normal blue-violet, through pink-purple shades to white, as well as the Confederate violet with its big blue patch in the middle of the white. Because these different colour forms arise naturally, there is limited virtue in applying cultivar names to them, unless they have some more-unusual distinguishing feature. For instance, it would be easy to imagine a plantsman spotting a self-sown white-flowered sister violet in the wild or in a garden, and maybe if he or she hadn’t seen one before, they would consider propagating it and selling it, and would be strongly tempted to give it a good cultivar name to help sales. But that scenario could happen hundreds of times, creating a sea of white-flowered sister violet cultivars; and most of them would be almost identical. Better, then, to use botanical names, which accommodate variation more readily than cultivar names, and save cultivar names for the more special ones. But unfortunately that hasn’t happened, apart perhaps from V. sororia f. priceana (though often wrongly stated as V. priceana or V. sororia ‘Priceana’) being adopted for plants having a white flower with a blue centre. So we are left with a state of confusing cultivar names. White ones include ‘Immaculata’, ‘Albiflora’, ‘Snow Princess’; reddish ones include ‘Red’, ‘Giant Red’, ‘Rubra’; speckled ones include ‘Freckles’ (white with bluish spots) and ‘Speckles’ (bluish with white spots); and more unusual is ‘Alice Witter’ (white with a pinkish-red centre). There is another area of confusion which I need to mention in order, hopefully, to make things clearer for those afflicted with the problem! In general V.sororia is often confused with V.cucullata, the marsh blue violet. This has led to some of the cultivar names for V.sororia (preceding paragraph) being applied to V.cucullata, which is not a valid thing to do. For instance, you might see V.cucullata ‘Freckles’ on a plant label in a nursery or even in a botanical garden: it is a mistake. V.cucullata actually has very few properly named cultivars (please correct me if I am wrong), so be prepared for most such cultivars turning out to be of V.sororia. To discriminate between V.sororia and V.cucullata: first, ignore flower colour; then, if the seed pods are held in the air (as opposed to at or below soil level) favour V.cucullata; and if the seed pods have sepals whose appendages are large (as opposed to insignificant) also favour V.cucullata. The height of the flowers, above or with the leaves, is often given as a distinguishing character, but I do not find it reliable. Lastly, how to interpret ‘defunct’ above… This means that the criteria originally established to distinguish those ‘species’ are now thought unreliable; they are not particularly significant points in a natural spectrum of variation. Plants bearing those defunct names really need to be re-assessed on an individual basis to determine which subspecies they should be named as, but you can be fairly sure (apart from general possibilities of complete misnaming on nursery plant labels) that they are V.sororia or some sort. to be a synonym of V. sororia, however Mike you have a couple of things in your message that I must disagree with, first V. nephrophylla is a distinct species in its own right and has never been considered a synonym of V. sororia, secondly V. affinis, now I know that Landon E. McKinney in his ‘A Taxonomic revision of the Acaulescent Blue Violets (Viola) of North America., published in 1992 considered that V. affinis was a synonym of V. sororia but from my research I can not find any one else to support this theory, in fact I believe that Kim Blaxland will be investigating this in the near future as she believes that V. affinis shows enough characteristics to retain its status as a distinct species. I think you will find that this violet is actually a hybrid between V. sororia and V. cucullata. Freckles is I am informed another cultivar that should retain its status, and lastly as far as I am aware their are cultivars that can be attributed to V. cucullata, at least in part as the violet ‘Governor Herrick, and subsequently its sports are supposed to be crosses between V. cucullata and as yet unnamed violet cultivars. Norma, The photograph of V. sororia (syn. papillionacea is not at all typical of the species. I have seen a few odd flowers with similar markings, which may be due to insect damage, or virus, or may be a chimaera [correct spelling, checked]. Kim: V. sororia ‘Freckles’ has dark glossy green leaves which distinguish it from all other forms of the species when not in flower. It was originally discovered in Baraboo, Wisconsin. It has clubbed hairs on lateral petals. Seeds of pure white form of Viola sororia, from Bowman’s Hill, black, 2.0 x 1.3 mm. Seeds of V. sororia albiflora, ex Peter Robinson, pod 1.2 cm, seeds black, 2.0 x 1.2 mm. Seeds of V. sororia pink confederate (Alice Witter – cucullata x sororia) are mid to dark-grey, 1.7-2.0 x 1.0-1.3 mm. Seeds of special crosses of V. sororia forms (some with cucullata hybrids), mid to dark grey, some speckled, 2.0 x 1.0-1.3 mm. Atlas of the Flora of the Great Plains: Viola pratincola Greene has been described as occurring throughout the Great Plains, with concentration in the south-east, also greatly concentrated outside the Great Plains in Missouri, the state to the east of Kansas. [WY, ND, SD, MN, NE, IA, KS, MO, OK, TX]. Atlas of the Flora of the Great Plains: Viola sororia (Downy Blue) has a distribution almost exactly the same as Viola pubescens, on the eastern edge of the Great Plains, from northern MN to southern Oklahoma, with its centre of concentration on the border of Kansas and Missouri, along the Missouri River. Viola pratincola has the same eastern distribution but spreads further west through the Great Plains. Viola missouriensis is centered in the same area of eastern Kansas and western Missouri, but also is spread further west, but does not have the distribution in the north of the Great Basin. The caterpillars of many Fritillary butterflies feed on the foliage, including Speyeria diane (Diana), Euptoicta claudia (Variegated Fritillary), Speyeria aphrodite (Aphrodite Fritillary), Boloria bellona (Meadow Fritillary), and Boloria selene myrina (Silver-Border Fritillary). Wing span: 1 3/8 – 2 inches (3.5 – 5.1 cm). Reference for information above is website: USGS Butterflies of N. America: www.npwrc.usgs.gov. Parking area on PA Route 322, west of Ephrata on Lancaster/Lebanon border: They were growing in sandy soil, of metamorphic origin, very acidic because there were kalmias growing a few feet away, also Gaultheria procumbens (Wintergreen, teaberry) and Viola pedata, which hates lime; also V. sororia in woods and V. blanda, and V. sagittata ssp. ovata. The Variegated Fritillary (Euptoieta claudia) is a North and South American butterfly in the family Nymphalidae. Even though the Variegated Fritillary has some very different characteristics from the Speyeria Fritillaries, it is still closely related to them. Some of the differences are: Variegated Fritillaries have 2-3 broods per year vs. one per year in Speyeria; they are nomadic vs. sedentary; and they use a wide range of host plants vs. just violets. The wingspan measures 1.75-2.25 inches.